Almuerzo en el restaurante Furukroa. Tour privado solo para usted y su fiesta asegura atención personalizada. Transporte de ida y vuelta desde los alojamientos de Bergen. Disfrute de una cómoda recogida desde su hotel en Bergen a las 8.30 h Reúnase con su guía turístico y no dude en compartir sus intereses o preferencias; el itinerario es flexible y esta excursión privada le garantiza una atención personalizada. 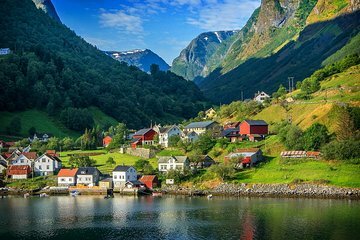 Vaya por la autopista E16 en su vehículo privado, viajando por el famoso Dale, la compañía de suéteres de Noruega del pueblo de Dale, a continuación, a través de la ciudad de Voss. Haga una breve parada en la catarata de Tvindefossen para hacer fotos, tomar una respiración profunda de aire de la montaña para oler las limpias aguas cristalinas. Continúe su viaje a Hotel Stalheim para visitar su bien conocida terraza, que se abre a las fantásticas vistas sobre el valle de Naerøydalen, declarado Patrimonio de la Humanidad por la UNESCO. De vuelta en su vehículo, descienda el dramático empinado camino de Stalheimskleiva hasta el fondo del valle, donde podrá visitar el antiguo pueblo de Gudvangen. Salida desde Gudvangen en un crucero (costo adicional) a Flåm, explorando la zona alrededor de Aulandsfjord y Naerøyfjord. Elija entre un bote inflable con piso rígido, un yate de motor y un ferry de pasajeros para realizar el crucero. A su llegada a Flåm, disfrute del almuerzo en un restaurante de la zona (por cuenta propia), y luego disfrute de tiempo libre para echar un vistazo a las tiendas de recuerdos, el museo de ferrocarril Flåmsbana o la cervecería local a su propio ritmo. Después del almuerzo, vuelva al coche y se dirigirá hacia el pintoresco mirador de Stegastein, plataforma de 30 metros de longitud colgando sobre Aurlandsfjord a 650 metros por encima del nivel del mar. La estrecha carretera y el mirador le dará algunas impresionantes fotografías y emociones intensas. Aborde del tren Flåmsbana desde Flåm hacia la estación de tren de la montaña de Myrdal, situada 2,844 pies (867 m) por encima del nivel del mar. Durante el trayecto panorámico, tenga la cámara preparada para disfrutar de vistas de los cañones, laderas y cataratas. Haga una breve parada en las estruendosas cataratas de Kjøsfossen. Cambie de tren en Myrdal para volver a Voss; a su llegada, podrá visitar una iglesia medieval que data de 1277 y una cruz de piedra del siglo 11. Por último, haga el viaje de vuelta de 1,5 horas en coche a su hotel en Bergen para poner punto final a su excursión. He happened to be a very talented photographer, he took some of my pictures during this trip, and as a courtesy, he actually email Them to me :-. What an amazing picture. I am so thankful that I found this trip and Got bjorn as my guide. It's definitely worth every penny. Fabulous day tour ! We found our personal guide Bjorne, to offer great insights and history to our 1st visit to the fjords of Norway. The only glitch was some communication with Viator with confirming and understanding the day's itinerary. We took this tour as an alternative to Norway in a Nutshell. We enjoyed the more private and individualized experience, as well as the added stops along the way Tvindefossen waterfall and UNESCO site at the Stalheim hotel. We were picked up on time and our tour guide was timely and dependable at each and every stop. Everything was organized in advance, which made it all nice and easy for us. Our guide was very nice. A few things to mention: the description makes it seem like lunch in organized at a specific place it is not, you eat on your own in Flåm and it also makes it sound like the cruise around the fjords is included it is not - it is 70 euros additional - although expensive on top of the tour itself, it was the highlight. This was the absolute best tour. you could ever take. Our guide, Raivis, was truly amazing! Ask for him if you book this tour! He felt like a part of the family. He picked us up at the hotel, drove us to Gudvangen, via Hotel Stalheim a must see for views where we took the ferry to Flam and then met us. Taking the ferry, even though it cost extra was a must do, it had the most beautiful views. We had lunch told us to get a beer at the bryggerie and then since we had some time before the train to Myrdahl, we went up a very curvy road into the mountains for the most fantastic view of Naeroyafjord. We took the train to Myrdahl, saw wonderful waterfalls...there is a surprise at the most stunning of them and then took the train to Voss. He met us there and we took in another waterfall TLC--forget the song Don't go chasing waterfalls, which was amazing. We all thought this made the trip to Bergen. Also make sure you take the train either from Oslo to Bergen roundtrip or one-way. You will be totally amazed by the views. Raivis was the best tour guide! It was such a beautiful trip, i highly recommend it. It was a fun trip with my boyfriend, and we have taken in many view that will not be forgotten. Bergen is a very beautiful country. I would definitely recommend people to go. Our tour guide/driver, Mr Ivan, was indeed a very obliging, honest and helpful man. Thank Jesus that He has blessed us a fantastic guide throughout our whole trip. He is so far the best guide that I have ever met during all my holidays. Highly recommend him to everyone. This is my true and honest comment. He did not pay me to write it. Ivan was a fantastic guide. If you only have one or two days in the Bergen area, this is a great way to see a lot in a short amount of time. The views in Gudvangen were unbelievable and the train from Flåm was a very special experience. Would definitely recommend. Nice tour with wonderful sights, however be forewarned when booking this trip! After booking you receive an email confirmation stating that if you want to do the boat ride portion of the trip there is an additional fee, though it clearly states that it is part of the overall itinerary. In addition the last leg of the journey was supposed to be a train ride back to Voss and instead, it was just a very long car ride.